What a great combination: Champagne & Muscles (not Mussels)! Well another Henley Royal Regatta has been and gone and if you weren’t there you missed a treat. How I hate my job NOT! The rowing is, for ladies, at Henley Royal Regatta, the loveliest sight that one can behold with rippling muscles firing past the marquee every few minutes what more could one ask for?! Aside from all that excitement, our River Lounge facility at Henley looked absolutely superb this year and many of you commented on how relaxed the atmosphere was throughout the day. 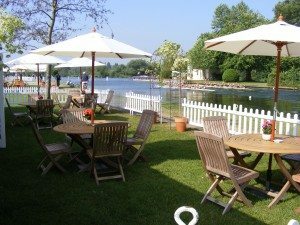 We pride ourselves on giving this venue for Henley Regatta a modern twist with flat screen TV for those avid Wimbledon fans and chill out area with a masseuse that will happily give you a head, neck and hand massage to help ease your troubles away and super Jazz duo who play many of their own songs and are happy to play your requests. The food of course was exceptional with the menu created by Simon who many of you will see helping to run the marquee, offering a mouth watering selection of breakfast canapes, cold starter and main course, dessert and cheese. If you are still hungry, afternoon tea will definitely fill any corners left and the champagne, Pimms and wine flow in plentiful supply throughout the day. Thankfully the sun shone and all days were dry leaving guests able to enjoy the garden area just in front of the marquee. Our positioning means that you can watch the very start of the action at Henley and if you want to get up close, our 12 man punt does regular 45 minute trips along some of the course. We also offered a new facility, The Bird Place Garden Party which is located just off the course by Henley Bridge but guests can enjoy sufficient rowing action by taking the 2 hour morning and afternoon cruises on offer. 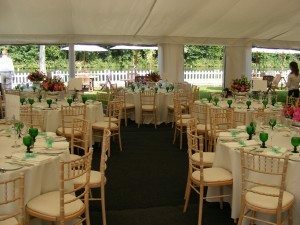 A very traditional marquee with jazz band and lovely gardens meant my clients had the best of both worlds and all who attended were incredibly happy with the day. For those still not tempted, the price surely must at only £220+ VAT pp for The River Lounge & £195 + VAT for Bird Place, with full bar all day and enough food and Champagne to sink the Titanic, it really is superb value! Thanks must go to Simon and his team in the River Lounge and Nigel and staff at Bird Place. To all the clients I met at Regatta, lovely to catch up and look forward to seeing you soon. Is Murray ready for the Final?